Alfred answered a newspaper ad for what he hoped would be an easy job. What could be more effortless than taking care of a bunch of old books? He soon learned that books can be more than just stories, they can also be a gateway into another world. Of course, where magic and power exist, there is always someone who seeks to control or destroy. Before he can understand how or why, Alfred is catapulted into a quest to save mankind’s greatest stories, and on the way, humanity itself. Tales is a point & click adventure rendered in classic pixel art style. 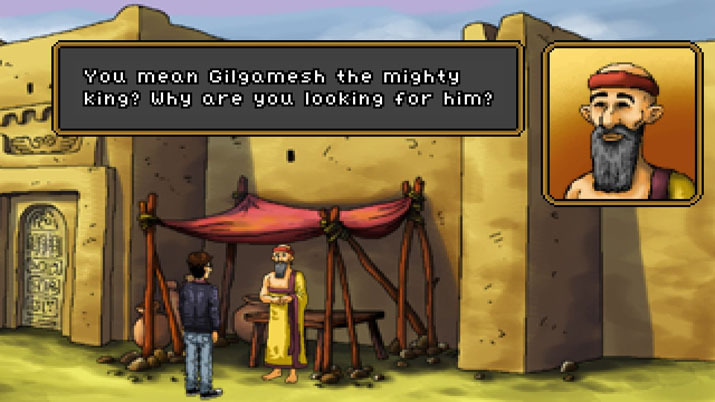 However, by modern standards, Tales is not an ordinary point & click game. Most contemporary games in the genre requires the player to find items and combine or use them on the environment. While this is a critical element of Tales, it also features puzzles that defy convention and demand direct input from the player. This puzzle style is closer to adventure games from the 80s when the player had to know what they wanted to accomplish to solve a problem. Clicking an object and touching other interactive items on the screen hoping to produce a result was not an option. Instead, the player had to type a command like “tie rope to the bucket.” Although Tales is not that demanding, it doesn’t handhold the player as much as other games in this genre often do. In one such puzzle, the player is given a riddle and has to enter the correct answer manually. It isn’t multiple choice, there is nothing the player can find that will give the answer; they must solve the riddle to move on. As a gamer who has played dozens of point & click adventures, I found this both refreshing and nostalgic. It’s not a new approach by any means, but it has been out of popular use for so long it feels fresh. Another trend-bucking device used in this game is less enjoyable. The common trend for contemporary games is to keep puzzles, and everything needed to solve them constrained to a single area. Tales revives the older method of keeping every area alive and connected but added a twist. In Tales, just because you’ve “solved” an area, it doesn’t mean you won’t have to go back and get something you’ve left behind. Some puzzle solutions require shuttling items from one area to another. This can be tedious, but what makes this painful is that it’s only possible to transport one item at a time. Single item inventory management is miserable. So much time is spent moving items around that it takes away from the fun. I was swearing at the screen when I left behind something and had to go back for it. I found myself drenched in dread when I encountered a puzzle with no obvious solution. It meant combing previous areas to see if I could find something that might be useful and hauling to where I might need it. However, if I was wrong about an item’s usefulness, then I had to decide whether to return it where I got it or try to remember where I left it in case I needed it in the future. Despite the terrible one-item transport system, I found myself engrossed in the game. The puzzles need the right blend of ingenuity and thought to be genuinely fun. They often require careful attentiveness to find clues that aren’t always obvious, but if a player gets stuck, there is an in-game system that provides spoiler-free hints in a way consistent with the game’s storyline. 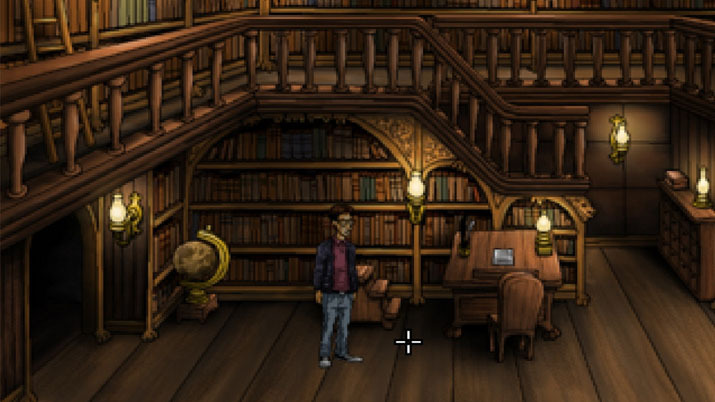 At the start of the game, Alfred is told that he cannot leave the library. At first, I thought Tales may end up a rather dull game as a result but soon discovered that Alfred has entire worlds to explore in the pages of the library’s books. Each world has its own music, costumes, creative characters, and unique environment. The game is dialogue-heavy, and there is a lot to learn about each world. Unfortunately, in some areas emotions come across stilted when characters are speaking, and it’s obvious they’re reading a script. Furthermore, accents on “ethnic” characters are wobbly at best. It’s as if the speaker forgets which accent to use or isn’t quite sure how the words are supposed to sound. The main character Alfred saves the day by being ridiculously stuffy and British in the face of the mad circumstances in which he finds himself. His responses to the other characters often had me laughing out loud. The ensuing hilarity makes the rest forgivable. Technical: Getting the game going wasn’t easy. When I first launched the game it attempted to load in full-screen mode and crashed. Rebooting did not solve the problem, On the third attempt, I entered “setup” mode. In setup, the settings are not well explained. After 15 minutes of trial and error, I found a configuration that was playable. After initial setup, I was able to play in full-screen mode, but I discovered a glitch that made this option unpalatable. In full-screen mode, a black frame surrounds the playfield. The playfield only shows a small portion of the environment, and the character must move to expose the hidden sections of the world. The glitch placed a floating box in the frame that revealed sections that would otherwise be covered. The box slid across the screen as the character moved and was painfully distracting. Nothing I tried removed the box, so I settled on “windowed mode,” even though it is not my preference. Screen resolution and display settings should be included in the game interface. The average user may not know which graphics driver or graphics filter to use, so these settings should be automatic and/or better explained inside the game itself.